The 2015 BMW 6 Series gets a new high-performance model this year: the Alpina B6 xDrive Gran Coupe. With an upgraded engine and suspension, the B6 bridges the gap between the standard Gran Coupe and the even higher-performance M6 Gran Coupe. The rest of the coupe and convertible lineup carries on the tradition of sophisticated driving pleasure. With prodigious power, advanced technology, and luxurious surroundings, the 2015 BMW 6 Series offers a surprising value compared to competition like the Jaguar XK and Mercedes-Benz E-Class Coupe. Of course, "value" is relative, as the base price of a BMW 6 Series is more than $75,000. If that's too dear for you, the Audi S5 offers a quick package at a considerably lower price. BMW's own 4 Series coupe does the same, and keeps that coveted badge. The new 2015 BMW Alpina B6 xDrive Gran Coupe offers more performance than the 650i xDrive, but more luxury than the M6 Gran Coupe. Alpina, by the way, is a 3rd-party high-performance BMW tuner, working so closely with BMW that its cars are sold in BMW dealerships. While Audi may still have an edge with interior aesthetics, the BMW 6 Series isn't far behind. More premium materials and interesting shapes are finding their way into new BMWs, and the latest-generation 6 Series may be one of the best examples yet. This goes double for the Alpina B6, with its bespoke cabin including unique leathers, Myrtle wood accents on the dash, and other premium touches. The two rear seats in the coupe and convertible are tight for adults, but acceptable for the Gran Coupe. The black fabric top on the convertible 6 Series models leaves cargo space largely unaffected when folded. Coupe, Gran Coupe or convertible, the 2015 BMW 6 Series boasts an athletic profile, one defined by a long hood and a striking crease that's nearly the length of the body. The elegant and aggressive exterior looks confident, not cocky. The 6 Series Convertible is an elegant tourer with the top down, but lacks the visual balance of the Coupe, especially when the top's raised. That said, the M6 performance models definitely lean more toward "cocky," and are distinguished by wider 19-inch wheels, quad tailpipes and carbon-fiber composite roof panel. Alpina B6 models get unique wheels, and two unique colors. 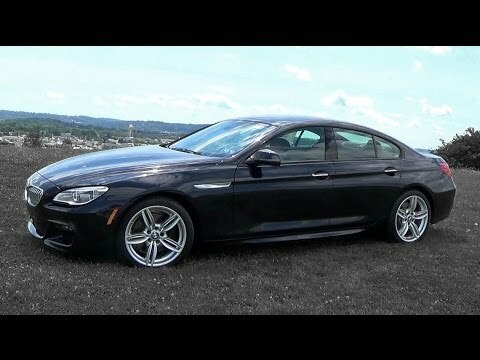 The 2015 BMW Alpina B6 xDrive Gran Coupe offers a unique experience in the BMW 6 Series range. With power close to what you get in the all-conquering M6 model, but with a bespoke interior treatment unavailable in any other model, the B6 offers tremendous performance and luxury in one package. It's as if the B6 magnifies everything we already like about the BMW 6 Series: There's the luxury, which - across the lineup from coupe to convertible to Gran Coupe sedan - means quiet and comfortable cruising suitable for mile after mile of open-road touring. Yet when the Driving Dynamics Control is in Sport+ mode, the 6 Series transmission kicks down eagerly and the suspension tightens, transforming this big car into a surprisingly nimble sporty car. Even the "base" 640i Coupe leaps to 60 mph in just over five seconds, and the M6 does it in just over four. Bring money. While the base 2015 BMW 640i undercuts its competition, it's still more than $76,000 to get into the driver's seat. Want a V8 engine, you say? That'll put you back more than $87,000. And that's for the standard 2-door. If you want a Gran Coupe, add about $2,000, about $7,000 for the convertible. And if you want the all-weather stability of all-wheel drive, that'll run an additional $3,000. The new Alpina B6 starts a little over $118,000. If you want more options, prices increase rapidly. Before buying, be sure to check the Fair Purchase Price to see what others in your area are paying for the BMW 6 Series. Long-term resale value is expected to be better than that of the Jaguar XK, near that of the Mercedes-Benz E-Class coupe, and lower than that of the Audi S5 and Mercedes-Benz C63 AMG. Even a base 6-cylinder 640i Coupe comes equipped with a leather and wood interior, xenon headlights, navigation system with 10.2-inch display, dynamic cruise control and rearview camera. The standard audio is a 9-speaker/205-watt system. Along with a V8 engine, 650i models add even softer Nappa leather, 20-way power front seats, 19-inch wheels, and a 12-speaker/500-watt audio system. Alpina models offer even more luxury accouterments, including Myrtle wood trim. BMW 6 Series xDrive models offer all-wheel drive, and all BMWs offer four years or 50,000 miles of scheduled maintenance. Most options for the 2015 BMW 6 Series are bundled into packages. There's the Executive Package with amenities like ventilated front seats, soft-close doors, and a futuristic head-up display that projects travel information onto the windshield so you can focus on the road. The wonderful Bang & Olufsen sound system is a gotta-have-it option, and performance-minded drivers should check out the active steering and Adaptive Drive. A night-vision system can detect pedestrians via infrared camera. Individual options include things like 20-inch wheels and ceramic controls for the iDrive command-center module. While the BMW 6 Series is referred to as a family of coupes, the reality is that the Gran Coupe is actually a sleek 4-door sedan. That it means the goodness of the 6 Series is open to anybody who wants it, even if you can't give up 4-door practicality. Four powerplants are available for the 2015 BMW 6 Series, three of them variations of the same V8. Base 640i models use BMW's much-loved 3.0-liter turbocharged inline-6 that makes a robust 315 horsepower. Move up to the 650i and you'll get a 445-horsepower 4.4-liter turbo V8. The Alpina B6 uses a handbuilt version of that engine, tuned to 540 horsepower. Above that is the M6, also using a 4.4-liter turbo-8, but one tuned to a sizzling 560 horsepower. The 640i, 650i and Alpina B6 use an 8-speed automatic transmission, with either rear- or all-wheel drive. M6 variants use a 7-speed automatic or 6-speed manual and are rear-drive only. To save fuel - premium fuel - the 2015 BMW 6 Series uses auto start-stop to cut engine power at idle. The 2015 BMW 6 Series slots between the 5 and 7 Series cars with a coupe, a convertible, and a 4-door that BMW calls a "Gran Coupe," but we all know is really just a sleek sedan. Sleekness is all part of the game though, as the 6 Series is designed to offer eye-catching style over practical transportation. All three models offer plenty of style and performance, with engines ranging from a turbocharged 6-cylinder to a couple different V8 models. With roots that trace back to the late 1970s, the 3rd-generation 6 Series remains a leader in grand touring, even against such tough competitors as the Jaguar XK, Mercedes-Benz E-Class Coupe and Audi S5. Best vehicle ever BMW 650i. This vehicle has great performance. My biggest issues is with the high performance tires. The roads in my area cause me to constantly purchase new tires. That is the only issue related to this vehicle. It drives well and was a great purchase. I have driven other vehicles in the past and this vehicle is by far the best. The gas mileage is great. Great performance, beautiful, reliable. Economic.. Good warranty by manufacturer.. Love the ride especially when driving with the top down and the fact that is a hard top that will last forever. My car is very dependable and has the option package that fits any car buyers needs and has very great gas mileage.